Search Engine Optimisation (SEO) may seem complicated and overwhelming to many, but there are a variety of easy methods you can use to lift your business above your competition. All of these tips require minimal technical skill, so you don’t need to be an SEO whizz to start upgrading your online presence. SEO is a long-term strategy; if you make a couple of changes today, you won’t be on page one of Google by tomorrow. However, if you’re looking to improve your Google ranking without hiring a professional, these tips can help your business be found online and increase your web traffic immensely. In such a digital world with so much information available at the end of our fingertips, we’ve become extremely impatient when visiting websites and waiting for content. If your web page hasn’t loaded within a few seconds, you can expect to have a massively high bounce-rate with people clicking back and away from your site. If users can’t find the information they’re looking for because it hasn’t loaded in quickly, they’ll be moving on to alternative sites instantly. One of the main causes of a slow-loading webpage is unnecessarily large image files, but there are plenty of online tools available for you to resize images and reduce file sizes. I use a website called TinyPNG to create compressed files, by simply dragging and dropping images on to their homepage. Within a few seconds you can download your new files, sometimes saving up to 80%. If possible, I try to keep my image files under 500kb, although for smaller images on an e-commerce site, for example, they could easily be under 50kb. This kind of file size saving really adds up over the whole website, especially with an image-heavy design portfolio. Luckily, you can also upload/download files in bulk, so you don’t need to spend hours compressing each image individually. If your image dimensions are too big for how they’ll be displayed on your site (files directly from a camera or phone are often much larger than you need for web), there are a number of websites where you can upload your images and fine-tune them to fit your needs. 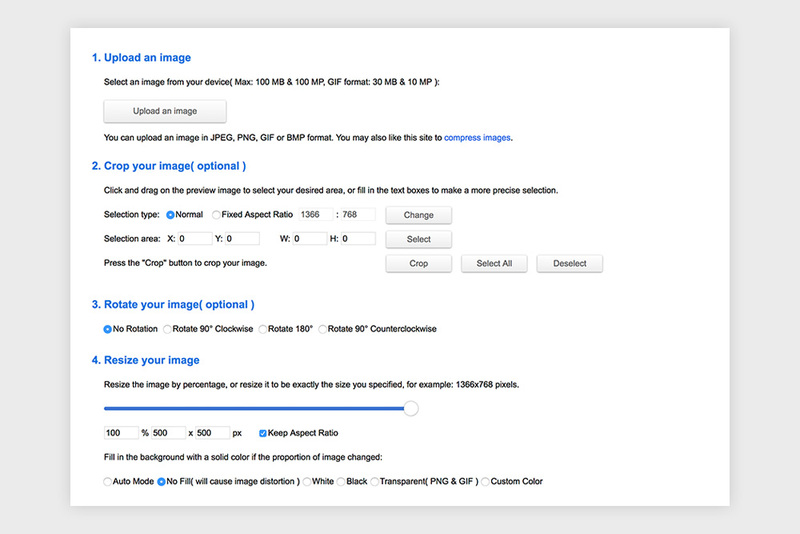 One of these sites is ResizeImage.net, where you can choose new dimensions, ratio, rotation, image quality, and file output. I usually save bigger header images for websites at 1500px wide, with standard blog images, thumbnails and portfolio images at approx. 1000px wide. Meta page descriptions are an opportunity to summarise web pages in a few short sentences. These descriptions often appear underneath the page title in search results, so a good summary of what the page is all about can be influential in gaining visitors to your site. There are a few different ways to add meta descriptions on Squarespace, and they all come under different names so it’s easy to get them confused. 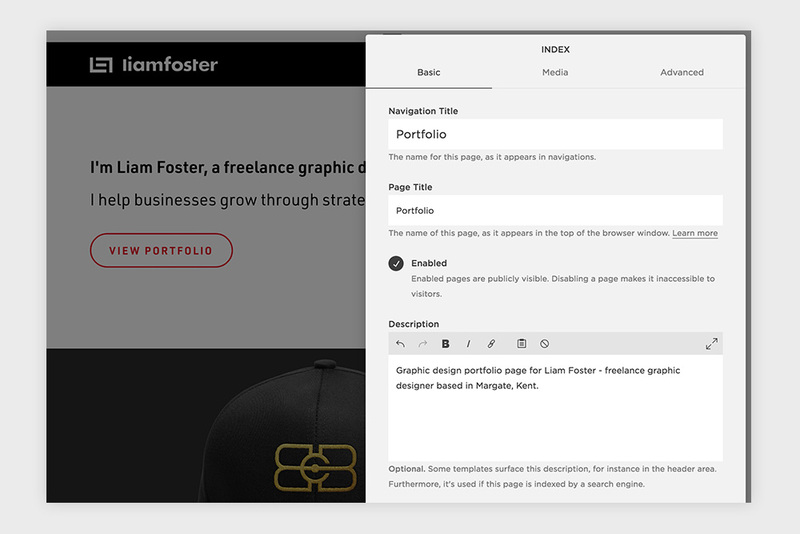 Be aware, however, that some Squarespace templates will display these page descriptions within the content of your site, rather than just in the search engine results. This is definitely an annoying Squarespace SEO feature, and one that will hopefully be altered in the near future. Adding alt (alternative) tags to your images is beneficial for a couple of reasons. Firstly, if your image fails to load properly, it will display your description of what the image is. This means your reader isn’t left completely in the dark about your content (or lack of). Secondly, search engines can look at your alt tags to establish what your content is about and align this with relevant search results. This is a helpful technique in gaining traffic; if your images contain descriptions of what your target audience is looking for, then search engines will be more likely to show your site in their results. 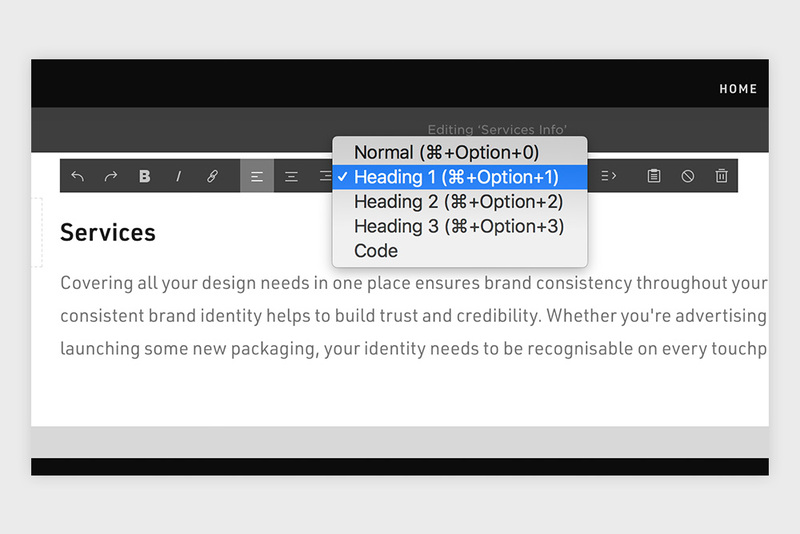 While alt tags should contain keywords to attract your target audience, it’s still important that your description makes sense to humans and is easily readable. If you want to choose an image layout other than ‘Inline’, make sure you follow the steps above first, then choose your layout after (otherwise you won’t have any alt tags at all). Submitting your website to search engines is a means of letting them know that you have new information to share, and are requesting this information to become indexed. Being listed on Google and other search engines is one of the most effective ways of gaining targeted, organic traffic to your site (the most popular search engines in the UK are Google, Bing and Yahoo). To check if your website is on Google, simple search “site:yourwebsite.com” (replacing “yourwebsite.com” with your domain name). This will display every one of your web pages that Google knows about. If it doesn’t, you may need to submit your site to Google. After you’ve registered on Google Search Console and Bing Webmaster Tools, you can submit your sitemap XML file. This simply means your website will be indexed quickly and accurately by these search engines. Squarespace automatically creates a sitemap for you, so all you need to do to find your sitemap is type “yourwebsite.com/sitemap.xml” in to the address bar (replacing “yourwebsite.com” with your domain name). It’s important to give your website text a hierarchy through the use of proper formatting, as this shows search engines the specific headings, titles, body copy, bullet points and quotes on your page. Your main heading. This is generally the page or blog title. Used for body copy and general text. Using simple URLs with relevant keywords is rewarded by Google. They should be short, clean, and summarise the page content/use the page title. Squarespace automatically makes the URL of a new page the same as your page title, so in some cases this will work perfectly well. However, if you’re using index pages with numerous sections or have pages with the same titles, it will add a ‘1’ to the end of the URL. For example, instead of having a URL of ‘www.yourwebsite.com/page-1’ for a page displaying your design work, a better URL would be ‘www.yourwebsite.com/graphic-design-portfolio’. It’s also worth noting that Google doesn’t recognise underscores (_) in URLs, so ‘/graphic_design_portfolio’ would appear as ‘/graphicdesignportfolio’. It’s always best to use hyphens (-) in your page URLs, as this separates the words and allows Google to read them properly. This can be done for every page on your Squarespace website, so if you’re like me and use Index pages to compile all your page content together, it’s a good chance to give every section a specific URL with relevant keywords in. It’s still short and clean, but has a few relevant keywords to the page content, which helps Google to understand your website and therefore more likely to show it in relevant search results. 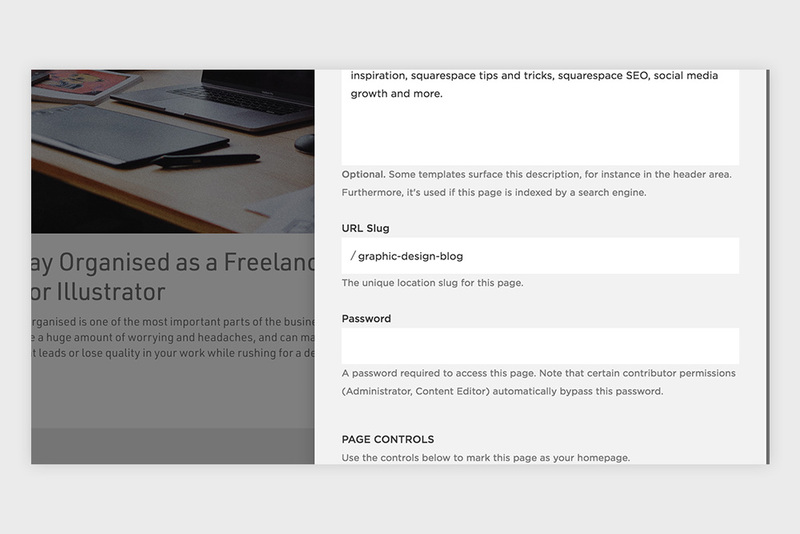 You can also edit your blog post URLs easily on Squarespace. The date is automatically added to the URL, but you can remove this if you’d rather take that out. I name all of my blog post URLs as the title of the article, although others like to keep it short and summarise the article with a few keywords. This can be done by clicking ‘Edit’ on your blog post, then on the ‘Options’ tab, add your custom URL under ‘Post URL’. Giving your images relevant file names is another simple method of letting search engines know what’s on your website. For example, in a blog post about logo design with an image showing the Coca-Cola wordmark, a simple description would be more beneficial than a random assortment of letters. ‘Coca-cola-red-logo-design.jpg’ gives you more of an idea about the image than ‘IMG123.jpg’. 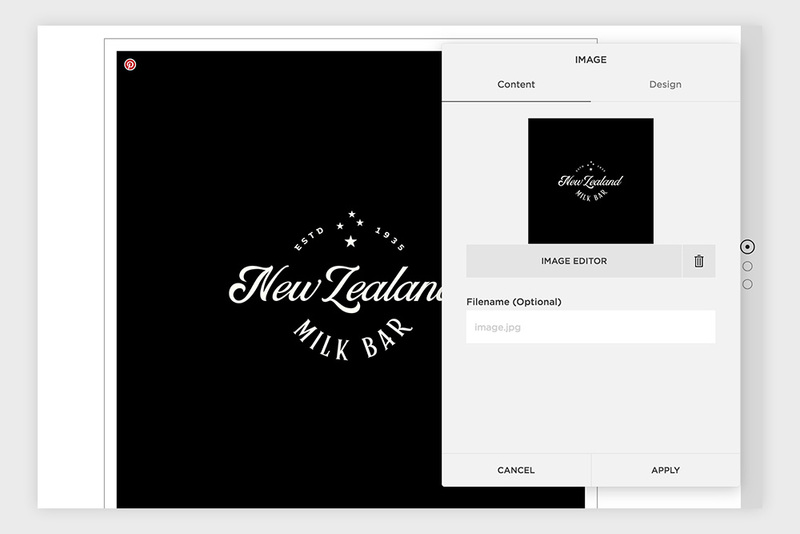 If you rename your images before uploading them to Squarespace, your filename will automatically be added in. Although if you want to give your images a relevant filename once they’re already on your website, you can do so by hovering on your image and clicking ‘Edit’, then simply typing in your image filename in the box. Although you can apply these techniques listed above to help improve your Squarespace SEO, the real winner over a long period of time is consistent, high quality content. Search engines reward websites that contain content that people find helpful, entertaining, informative, inspiring and so on. If your website is filled with information that attracts an audience, Google will place you higher in relevant searches as you’re matching the requirements of what people are looking for. If you continue to keep your website up-to-date with work, post informative articles that your audience will find helpful, show galleries of what you do and the services you offer, and consistently add relevant content, your website will organically rise in Google search results. There’s no substitute for great content!